It's not a gigantic pillow or a hammock (Moose stubbornly refuses to let me hang a hammock indoors) but it will do. After 2 days, seven stores, 5 hours and tossing ourselves countless times on a variety of mattresses we have purchased a new mattress. It is latex and according to the guy at the store (just like every guy at every store) it is the best one around. What I like about it is that it is soft and there are no springs. Really, who came up with the idea of sleeping on coils of metal? Insanity if you ask me. I can now sleep on a bed that doesn't sag in the middle both ways and does not have springs that find their way right into my rib cage. 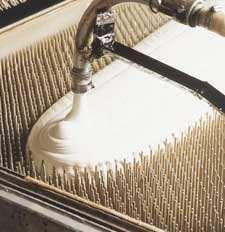 Funny that liquid rubber can turn into a soft mattress. I feel bad for the salesmen at the store - methinks the mattress business is slow right now and the poor guys probably have kids to feed. The kids had a blast having races on the adjustable Temperpedic beds at one store. Boba Fett's dream is to grow up and have a machine bed. Nutmeg thought that the stores were heaven as she bounced from bed to bed to bed. I could tell you about the fun things I have been knitting, or about our trip to the "otherside" of Portland this weekend, or post pictures of the sweater I knit for Mom, but today hasn't been so hot and I don't feel like bringing my "A" game. I was stressed out all morning about the annoying parents of other children, the state of the nation and the state of my garden. Everything the children said elicited a snap from me. eventually I went outside to work in the garden, shovelled some manure and then came inside to a splitting headache and a split library book. Tomorrow is the beginning of the annual mother torture known as swimming lessons. This time Commander C gets to sit out because the geniuses at the parks and rec can't figure out that homeschooling families have children of different ages, maybe if THEY had been homeschooled they would be smarter. Hopefully I will have a better day in spite of it. Oh, and I explained abortion to my sons today as we stamped out red envelopes. How exactly does one justify that insanity to a child? I don't know how people do it. I just told them it is wrong and evil and crazy, what else can you do? 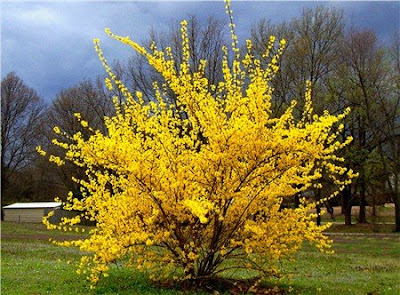 Our Beautiful World: It is so fun to be driving somewhere and see the bright blooming forsythia bushes. I am grateful for all happy yellow blooms in early spring. Blessings: A great marriage. I went into marriage thinking it would be the hardest thing I would ever do only to be serendipitously surprised by how easy it was. Maybe we are just fortunate that we fit well, don't hold grudges and love each other through service. Striving: Still to pray always and also to be prepared. This movie is a very close second to Notorious as my favorite film. Every shot in Hero is beautiful. The colors are breathtaking and the story it thoughtful, keeps you guessing and touches you. 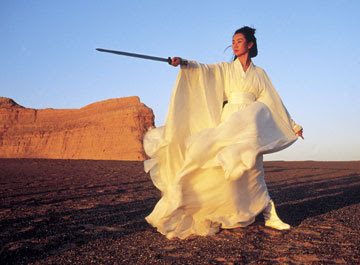 There is plenty of Kung Fu , flying warriors and the like. The guys will like the action, the girls will enjoy the romance. This film is a work of art. Somehow Quentin Tarantino got his name slapped on the front of the DVD. I don't know if he was a producer or just was the vehicle for marketing the film in the US. Don't let his name deceive you. 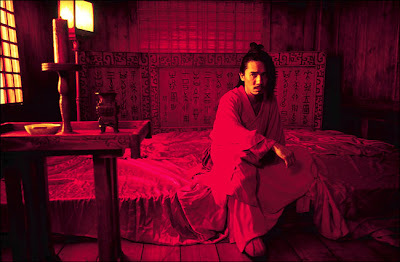 Hero is a Chinese movie filmed in Mandarin so there are subtitles, personally I think that improves a movie. The DVD does have an English track but I find it irritating and prefer the subtitles. It has been a while since I told you about my fantail goldfish named Sashimi. That night Moose came home and we decided that Sashimi looked lonely in the bowl so we loaded up into the car and went back to PetSmart and bought a plant and a friend. Boba Fett picked him out, his name is Little Fishy. He is even tinier than Sashimi and is very cute. As you can see it is good that I don't have a dog. If I think my fish is cute what would I think about my DOG? What kind of horrible dog lady would I be? But, I digress. Sashimi is on the left and Little Fishy is on the right. We have discovered a fun television show thanks to Netflix Instant Play. It is called Survivorman and this guy gets dropped off in the wilderness and has to survive for 7 days using only what he has with him, and he films it. 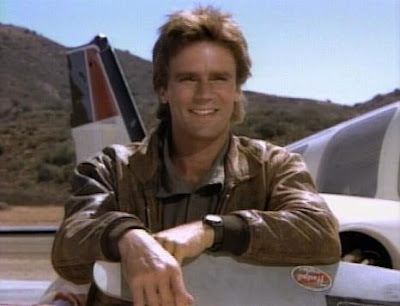 It's like real life MacGyver without the cold war and eco-terrorists but Les Stroud has completely inferior hair to Richard Dean Anderson. The show has sparked my imagination to say the least. I find myself looking at everyday objects and trying to figure out how I could use them to survive. As I was getting ready for bed I realized how most women have an extra valuable tool in their clothing. The bra. Stretchy, cups for carrying things AND underwire and hooks for fishing! You would be surprised how many times this guy is feet from fish but can't catch them! I think there should be a special episode of Survivorman called SurvivorGal. Meantime we are going to be practicing survival skills at home such as starting a fire with a fire bow and blowing sparks into tinder bundles. I may take to carrying a Mini Leatherman and lighter as well as my ResQme. Yes I really do carry a ResQme since my greatest fear in going off a bridge into the Willamette with my kids in the car. Yes, life jackets too. I know it is a little paranoid but when you see me soaking wet and ALIVE on the KATU news with 3 live children you won't think I am THAT crazy. I took the misshapen pieces of Nutmeg's doll house over to Keira's to see if she could help me finish it up. I had faith that she had inherited some skills from her father just as I inherited decorating skills from my mother - though osmosis. She did, she whipped that baby together in less than 2 hours while I watched, smothered baby Zachary in kisses and fetched diaper wipes to clean up wood glue. I have to find a way to cut out the remaining windows and decide what to do about the roof. We decided to scrap the stairs, even though stairs are a very important part of a doll house it just added too many complications, and so, our "Betsies" will have to fly up to the 2nd and 3rd floors. Alas. The boys have been confined to their room until it is clean. Commander C has refused to do any work and quietly went to sleep. Boba Fett has been wailing for 2 evenings straight. "I feel like I am going to die." he moaned last night in between sobs. Moose just prepared their dinner. I helped him deliver it to their cell. It is a nutritionally sound meal - just not too tasty. I was flipping through a magazine that came in the mail today. It was a magazine full of things that nobody needs and, I thought, nobody wants. But boy, was I wrong, because amidst the solar stones, toadstool chimes, trouser racks and painted hummingbird sweatshirts I found something I both need and want. I don't have a place to store my vacuum so I just hide it behind the entertainment center but now I no longer need to hide my vacuum, not with the Cow Vacuum Cleaner Cover from Collectionsetc.com. Who knew? Or I could save that money and feed an orphan. Today has been an especially uplifting Sabbath. To be honest, Sunday wears me out and I generally come home from church exhausted and on the verge of tears - not uplifted. Today was fabulous. I finally gave my talk on service. I tweaked it a bit so that it wasn't about Christmas, just service. I think the changes made it even better. It went over well. Kristin took my talk literally and brought me a note and plate of cookies this evening. Sunday School reminded me that Church History is the history of my family and the history of the world. I was reminded that the gospel is woven into the fiber of my being and I would be so very different without it. I was inspired to make the gospel so much a part of my life that it is apparent to everyone who I am. I will study gospel history more diligently. Relief Society reminded me of the importance of prayer and the simplicity of the gospel. I plan on savoring Elder Bednar's talk over and over again. To top it off Mommy Bee reminded me of a conversation years ago about spanking. No, I haven't started spanking my children but I don't think that I ask myself if I am parenting as Christ would as often as I used to and not nearly as often as I should. Thanks for the reminder. 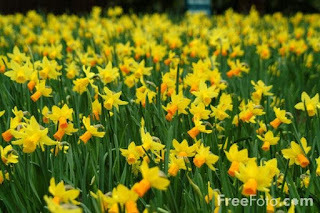 Our Beautiful World: My daffodils are blooming. My collection isn't stellar but 2 of my neighbors have out of this wold bunches of daffodils. Just maybe spring is on its way. Blessings: Watched a show about people losing their homes because they can't find a job in this economy. I am grateful for a home, and should something happen to our home there are other homes that would welcome us with open arms. This film has espionage, German bad guys, and Cary Grant. It has love, jealousy and the famous kissing scene. 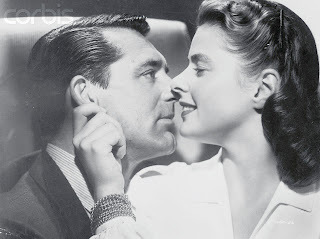 The censors wouldn't allow a kiss longer than 3 seconds so Hitch blocked an incredible scene where Grant and Bergman kiss for 3 minutes with dialogue interspersed. The camera never leaves them and there are no cuts. 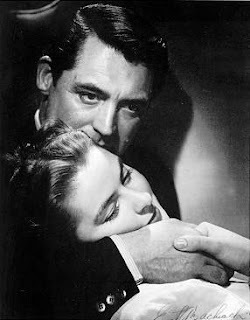 Keira and I viewed it last night and agreed that Bergman playing with Cary Grant's ear definitely makes up for any misgivings we might have had as to her fitness as leading lady. The filming and plot of this film are superb. I can't say enough good about it except watch it. Even though this was filmed in 1946 there are several not so nice allusions to the heroine's "virtue" or lack there of so be warned. Note to self: Never cross Cary Grant in love, he can be viciously cruel. 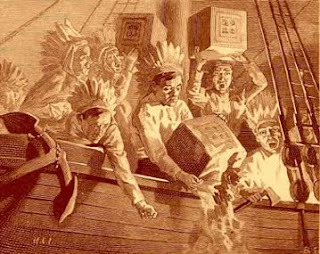 Read the story of The Boston Tea Party to the kids today as we addressed envelopes to our senators, representative, Pelosi, Reid and the President. We filled the envelopes with tea bags and did a war whoop as we went out to the mailbox in a line. Our story was written for children and put emphasis on The Sons of Liberty dressed as Indians and whooping their war whoop. I imagine whooping out to the mailbox in our own little tea party will be a memory that they remember forever. I sent an e-mail to On the Border - pretty much said what I blogged. They e-mailed me and called me and offered and are in the process of giving us our money back. WOW!!! Thanks OTB, I wish your food was yummier. I didn't want to cook tonight. My motto today was "Survive until five!" Moose was happy to oblige. We didn't feel quite like fast food and decided to try the new restaurant in town, On The Border. We placed a take out order for the Pico Chicken and Shrimp, Spicy Chicken Chimichanga and the Border Sampler. The gal on the phone and at the restaurant when Moose picked up the food were super nice. We have no complaints about the staff. That having been said, we are so disappointed. The Pico Chicken was terrible. The chimichanga was edible but only just. The sampler was greasy and was pretty much untouched we all had a nibble and then stopped eating it. The beans were O.K. but nothing to write home about. The salsa was middling at best. All in all, we are wondering if we can get our $43.97 back. We are still hungry not because there wasn't tons of food but because we couldn't eat it. We feel as if we were cheated. When you spend that much money on food you expect it to be edible. I ended up microwaving corndogs for the kids. 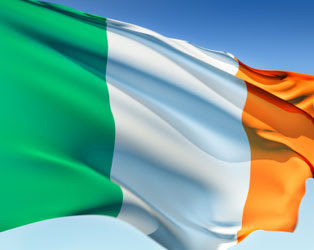 I am not Irish and I am not a fan of celebrating St. Patrick's day. I am not Catholic so the whole clover and the Holy Trinity thing doesn't inspire me and I don't drink so St. Patrick's Day doesn't really do anything for me. Really it is an excuse for bawdy behavior, pinching people, coloring a certain body of water and drinking. But what I really dislike is the imposition it is on my wardrobe choices. I like green, it is currently my favorite color. I don't like wearing it on a certain day for a holiday I don't observe. So, there I am in my closet deciding whether or not to wear green. I will be seeing many people today so if I wear a green sweater I am like a billboard saying "I celebrate cheesy holidays, come over to my house and see my stuffed animal collection dressed like leprechauns." If I don't wear green I risk being pinched all day long by my children and there is the possibility of annoying conversations with others. "I don't do St. Patrick's Day." But there I was in my closet and my green turtleneck looked so warm. Ultimately I chose to go with grey socks that have olive colored toes to foil the children if they start feeling pinchy. I feel like I spent way too much time thinking about green this morning. Then when I dressed Nutmeg I made sure her tights had some green in them to protect her from pinching as well. Thanks to the Irish for annoying me today. May they all have really bad hangovers tomorrow. Our Beautiful World: Earthworms, I know they are kinda slimy, gross and creepy. But these little guys are a garden's best friend. They aerate the soil, till it and decompose organic matter into soil. I am sure that they preform a multitude of other benefits. "Hooray for earthworms! "Including the gigantic one I found in the garden yesterday that scared the wits out of Nutmeg- it was the size of a small snake. Blessings: My kids have always been great sleepers. I have only had to wake up for good at some crazy early hour because the baby is awake about 5 times in my mothering career. Striving: To write a talk for Sacrament meeting next week. This is a bittersweet story of a couple who become parents. You'll laugh, you'll cry, you'll shake your fist. Regardless you will be caught up in the story. The giving the baby a bath scene is hilarious. Cary Grant is easy to fall for and Irene Dunne is especially likable. The ending is a little tough to swallow, you are happy for them but wish that they could have worked things out without the telephone call. I don't know why I did it. Somehow when I woke up this morning I just felt like today was the day. So when the boys were out rummaging through "The Dark Forest" looking for sticks for our bean tepee I called the neighbor to keep an eye on them, scooped up Nutmeg and whisked her away to the pet store. We were looking for a fish, a pretty, "girdle" gold fish, and I already had the name picked out. We stopped at Petco first because it is the closest pet store. The fish lady was not happy that I intended to keep a goldfish in a fish bowl. That's right folks I had the audacity to think that a fish could be kept in a bowl! I know, I know, there should be a tattoo on my forehead that reads "Animal Abuser." I was then treated to a informational lecture about how goldfish can live for 20 years (it was only 10 years the last time we bought a one) and by keeping a gold fish in a bowl I would be shrinking it's internal organs. All the while I am thinking "I don't want a goldfish to last a long time. I want it to die in 12-18 months so the next kid can have a turn picking out a fish or, alternatively, I can give up pet ownership completely when this one goes to the great aquarium in the sky. I eat fish! Why is she trying to make me feel bad about keeping it in a bowl?? At least I don't plan on eating it. Do you even think a fish wants to live for 20 years? Their life is pretty darn boring." She tried to sell me on a beta and then reluctantly said she would sell me a goldfish but she couldn't guarantee it. Guarantee it? A goldfish needs a guarantee? Ultimately I didn't like any of the goldfish at Petco so we told the fish keeper that we would think about it a little more. I ended up with one $1.99 fantail gold fish. I picked out the tiniest one because she was the cutest and I was still feeling a tiny bit guilty about the bowl I planned to keep her in. Nutmeg was very excited and insisted on carrying her through the store and all the way home. Once we got home I took my yarn stash out of the goldfish bowl, washed it out, added rocks (left from when Cheddar was still with us) and filled it up with water. Then we put her in. 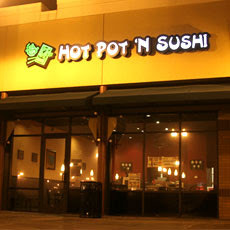 Moose noticed during a sushi run the other day that Hot Pot 'n Sushi has a happy hour. $1 per plate from 2-4pm. This was indeed exciting news and today the kids and I decided to try it out. We arrived just after 2 pm and as I approached the door I read the fine print "With $2.00 drink per person." Snap. We always drink water at Sushi Restaurants. So we ordered 4 sodas (yuck) they arrived and they were huge glasses. As we stared at the conveyor belt we were disappointed. There was nothing that we liked, no Tuna, nothing with cucumbers or avocados, no seared albacore, no unagi, and much to Commander C's dismay, no watermelon. We ended up settling for 4 plates of salmon nigiri (I think salmon is better cooked - call me crazy I just think the flavor is better) 2 plates of dumplings, some white fish, some shrimp nigiri and I begged a tuna off of the chef. There was a crunch roll that was met with less than enthusiasm. Then we had cream puffs and one plate of sesame balls for dessert. There were many things on the menu that were not on the belt and according to the sign the deal was for items on the belt only. There were a plethora of rolls with sauce on them but none were identifiable as our choice sushi ingredients. The nigiri peices seemed a bit small and didn't look as fresh as they could. There were also MOUNTAINS of plates stacked up ready to put on the line. At Sushi Town the chefs are actually making sushi and then putting it on the belt. If they do have piles of pre-made sushi sitting around they hide it well. On the plus side. The chefs were nice, talkative and Japanese, call me racist but Japanese sushi chefs make me feel better about quality. The hostesses were again nice and talkative and the ginger was not dyed (I assume dye is why some ginger is pink and other ginger yellow.) The lady sitting next to us had a full on conversation with Nutmeg and the sushi chef and they both kept cooing over how smart she was. She said "Her daddy must work at Intel." We ended up with 17 plates and 4 sodas making the total $23. I don't know that we saved any money over going to Sushi Town and paying regular price. We probably would have paid the same price and would no have consumed 96 ounces of pop and 5 plates of dessert at Sushi Town. We would not have wasted as much. Our satisfaction would have been higher at Sushi Town and our tummies happier. We have only been home for an hour and Nutmeg is hungry again, since she only ate one finger of rice 2 dumplings and a cream puff. Once in the car we decided the only thing we liked better was the cream puffs and I happen to know that I can buy a box of 36 of those at Albertson's or $5 or so. So Sushi Town has kept us for their business but I can't help wishing for $1 happy hour there. "Run Run as Fast as You Can. You Can't Catch Me I'm the Nutmeg Girdle"
Made from my stash. I found this Little Red Riding Hood, Goldilocks and the 3 Bears, Gingerbread Man and Three Little Pigs print at Fabric Depot last fall. I didn't have a plan but it just tickled my funny bone and I had to get it. I only bought a bit (1/2 yard) so making this skirt presented... challenges. I didn't use a pattern I just took my scissors, folded the fabric and went at it. In retrospect that wasn't such a bright idea but I managed to make it work. It is a kind-of-bias-cut-kind-of-circle skirt. I salvaged the homemade bias tape from the jalapeno place mats that never were, I had to go out an buy the fabric for waistband because inexplicably I didn't have a single scrap of red cotton. I suspect foul play. Nutmeg isn't sold on it yet. She resents anything I make her stop playing for and try on. We need to come up with a clever top. Using the Trader Joe's Mediterranean Feta Cheese with Herbs and Trader Joe's Sun Dried Tomatoes in Olive Oil, mix a salad of greens. Sprinkle Feta cheese and Sun Dried Tomatoes. Then sprinkle some Trader Joe's Roasted and Salted Pepitas ( pumpkin seeds but really tasty) for a crunch and serve with Trader Joe's Goddess Dressing. It is time to exercise your first amendment rights. Join taxpayers across the nation and let your voice be heard. Exercise Free Speech and the rights to Assemble and Petition. If you think the government is taking too much of your money and/or spending it on things that taxes should not pay for then you need to speak up. Our representatives don't listen or act in our interest - they simply follow the "leader." The IRS has become an organization of fear, if you refuse to pay your taxes you will go to jail, if you try to take on the IRS they will ruin your life. Just say "No" on April 15th. Find out where the closest Tea Party is and go. You might want to refrain from dressing like Indians as the Sons of Liberty did however. You CAN hang a tea bag from your rear view mirror though. I never thought I would attend a protest, yet here I am planning a sign. My representatives will not hear me and I will be heard. Too many have died for this right please don't throw it away. 1.Use the Tortilla as the pizza dough and place on a pan or baking stone. 3. Sprinkle with coarse salt. 4. Add chopped chicken, spinach, sun dried tomatoes, and feta cheese. 5. Place under broiler until edges are golden brown. -Tomorrow, a recipe using some of the same ingredients. Also a fun tip: We use Trader Joe's Marinated Chipotle Chicken skewers for chicken tacos. With the leftover chicken I make Pizza Kylene. 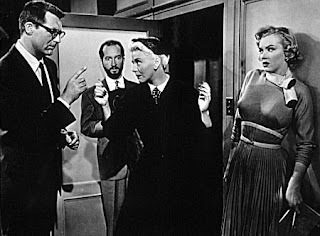 While watching "Monkey Business" with Cary Grant and Ginger Rogers I noticed an apron of which I can not find a photo. 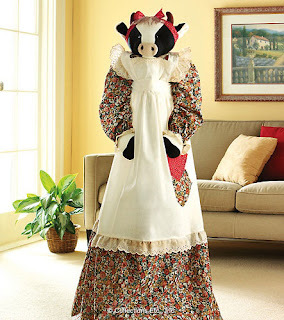 This apron was almost an entire dress with a circle skirt. It was a solid color with rick rack trim and ruffled sleeves. It will be made in a mother daughter combo. The movie is hilarious and Cary Grant is exceptional! Our Beautiful World: Violets are my favorite flower and my tiny little patch is blooming right now. They are the first flowers that bloom at my house. So tiny, purple, fragrant and happy. Blessings: We have the opportunity to attend the true church of Jesus Christ each and every week. Striving: Stop having an openly bad attitude about having to get to church at 8:30. "Suspicion" was Hitchcock's and our favorite leading man's first work together. 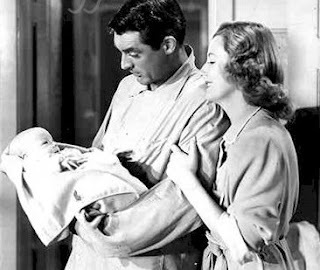 Cary Grant is so terribly like able in this film. You don't want to like him but you can't help it. You almost want him to succeed in the suspected evil deeds. Alfred Hitchcock once said: "One doesn't direct Cary Grant. ; one simply puts him in front of the camera." I can't help but agree. There are some iconic shots in this film, Grant and Fontaine struggling on the hill as well as the above picture; the glass of milk with a lightbulb inside to help it glow. 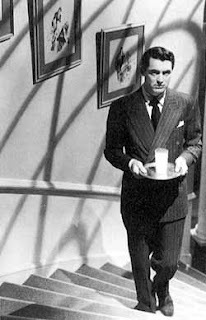 The ending that Hitchcock preferred for "Suspicion" was to have what you think is going to happen when Joan Fontaine drinks the milk, happen. The studio execs couldn't have their star leading man play a murderer so they concocted the sappy ending that ends the film. Joan Fontaine won an Academy Award for her roll in "Suspicion." I have been keeping a secret from my blog. Gardening. Last summer after we returned from the Land of Aloha I started checking out books on permaculture, urban farming, edible landscaping and such. Then I started tearing bushes out of my front yard (see above picture for the unlucky bushes - don't worry they found a home at someone else's house). Then I started measuring and mapping my yard. Then I made a list of fruits and vegetables my family likes to eat. Then I dug up big patches of clay and grass in my front yard. Then I purchased an espalier apple tree, a thorn less blackberry bush, a pomegranate tree and procured a rhubarb crown, I planted them. Then I had a friend bring me a big load of horse manure and I piled it up in my yard and I let it sit for the winter. 2 months ago I started saving my eggshells. Instead of putting them into the compost bucket, I washed them out and put them on the windowsill. About 3 weeks ago I stopped at the nursery and purchased onion sets, another rhubarb crown, 2 blueberry bushes, I planted them. I have been collecting seeds and going through my vegetable list and making plans. I frequent the nursery and ask many questions. Yesterday I made the kids huddle in a cluster on their knees and measured them, 28 inches. Then I took Boba Fett outside and grabbed a piece of yarn and two broken chair legs. We made a makeshift compass and scraped a 30" diameter circle right in the middle of what is left of our moss---I mean grass. Then I dug a trench around the circumference. Today I filled the trench with what I hope will be a good gardening mix, then Nutmeg and I planted beans, peas and sweet peas in the circle. We hope this will be a fun bean tepee come summer. Later I snuck out and planted my remaining 3 dwarf nasturtium seeds in the circle too. This is a true an accurate account of my gardening secret. Why have I been hiding it? Fear. Fear of Failure. Several times I have attempted to grow food in my yard and each time has been a dismal failure. We have been foiled by container gardening, poor soil and lack of sun. One year I had $150 worth of bark dust and garden soil brought in only to learn that the "garden mix" was dead, nothing would grow. Thus, I alternate between years of garden optimism and years of hopeless bleak despair wherein I do not even attempt to grow anything. This year I took over the front yard which has more sun and plan to frequent the horse farm for loads of manure. I will be successful. I just hope we don't move before I succeed. Portland is the saddest city in the nation according to BusinessWeek. Everyone is talking about it. Personally, I think their logic is flawed because they said they took green space into account (have they been to Portland???) and obviously they didn't put traffic into account or Seattle would have been up on top too. The weather (i.e. lack of sunshine) in the winter is pretty tough. We do have a self proclaimed liar in the Mayor's seat and we can't do anything about him until July, and people in Oregon know that the govt will do what they want to do regardless of the will of the people. 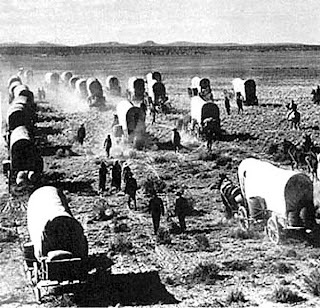 We have very few property rights, we are taxed to the hilt and they still claim they need more money. We are a horribly politically correct city but aside from that living in Portland is pretty good. 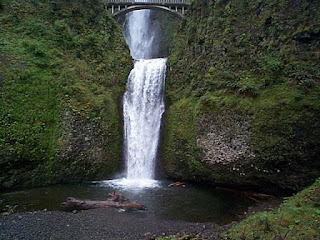 1- Close proximity to the Columbia River Gorge, the Cascade Mountains and the Oregon Beach. These are beautiful peaceful places. They are free and remind us who is in charge. 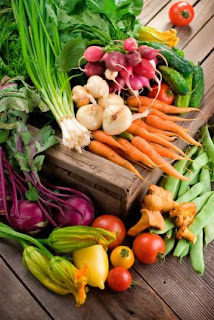 2- Organic food. I do not have to search to find not pesticided, hormone laden food. I have 3 stores in a very short distance that carry mostly organic foods and most grocery stores have a decent selection of organics. I don't have to work very hard to give my family good food. We also have Asian markets, Mediterranean markets, Indian markets and who knows what other variety of market. If you want it you can find it in Portland. You can grow food in your garden year round in Portland and there are numerous dairies, farms, farmers markets, orchards and berry fields. 3-I have told you before about my love for Fabric Depot. 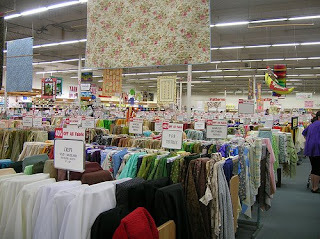 About how the first time I walked in the store I cried tears of joy, I had never ever seen so much fabric in one place. The best thing about Fabric Depot apart from selection is quality. This is good fabric, the kind it is hard to find anymore. The store is not half fleece, half crafts and a tiny corner for real fabric. It is the other way around. 4- As a homeschooler it is hard not to appreciate our library system. We have libraries everywhere, private, public, educational you name it. Most of them are connected. All I have to do is to put in a request from my home computer and I can have any book from any of the libraries sent to my tiny, and very convenient library branch. It is very rare that I can not find what I am looking for. 5- Powell's City of Books . 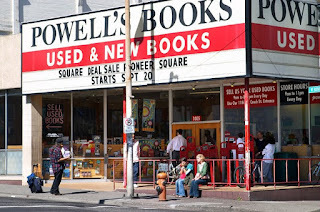 The largest independent new and used bookstore in the world. Need I say more? 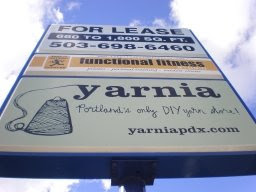 6-I haven't been there yet but just knowing that a place like Yarnia exists in my town is so awesome. There are plenty of other artsy and crafty paces in Portland. Someone is always making something and helping you to learn how to do something. 7- The parks. We are the park-iest city in the nation. We have the smallest park in the world, the enormous 5,100 acre Forest Park and everything in between. The parks are always well kept, accessible and the Parks and Rec provide a staggering variety of fun classes and activities. 9-Multi cultural community. I love that there are people from all sorts of cultures here in Portland. In my neighborhood there are lots of Indians, there are Russian communities, Japanese communities, Chinese communities (even a China Town) Hispanic, Filipino It is so fun to get to learn about different countries, food and customs. 10- I fit in here. In Portland I am not the only person that wears her baby on her back, I am not the only person that eats whole foods, I am not weird here. There are a lot of LDS people here and I really appreciate that after living most of my life in places where there were very few of us. There are also LOTS of homeschoolers. It is not at all unusual to be chatting with someone and find out that they are homsechoolers too. 11- The climate. Say what you will about the clouds and the rain but I will take that over cold, frozen snowy winters anyday. I enjoy sunny summers that are not blazing hot. I like the weather in Portland. We read this for our book discussion group. We were not impressed. A broken book. Depressing, no one grew or changed for the better. Stagnant, sad that is all I want to say about it. Inspiered to read after watching the film of the same title. I liked it almost as much as I liked the movie. I learned a little more about post-war Vienna. This was in the same volume as The Third Man so I figured that I might as well read it. Cute story about gambling, love, not relying on big wigs and what is more important than money. This was never one of my favorites. I liked it alright and figured I should give it another read. It is an okay read. Inspiring in the gardening and communing with nature area and in the positive attitude idea. I really don't like the last chapter. I remember Dickon being cooler. Definitely a children's book. Inspired to read after watching the latest Masterpiece Theatre treatment. Very good book, best I read all month. Twisting and turning, orphans and villains, fantastic coincidences and happy endings, typical Dickens.